SUNSMILE HERBAL TOOTHPASTE – The Healthiest Best Tasting Toothpaste out there on the market! Formulated with baking soda and a combination of enzymes and herbal extract, our toothpaste does not contain sodium lauryl sulfate or fluoride. The SunSmile Herbal Toothpaste is also free of artificial sweeteners, colors and flavors. Are you still using conventional toothpaste? If so, it’s high time you switch to Sunrider’s SunSmile Herbal Toothpaste! I just love the feeling of my clean teeth after brushing them with the Sunrider SunSmile Herbal Toothpaste! My teeth feel fresh and “crystal” clean. I feel that my teeth feel just wonderful. I also love the flavor of the Sunrider SunSmile Herbal Toothpaste as well, it is a “Minty fresh” flavor 🙂 There is no comparison to “other” toothpastes out there on the market. You will just love the way your teeth feel, how your mouth feels and how healthy your gums feel! My gums used to bleed whenever I ate an apple, since using the Sunrider SunSmile Toothpaste, my gums have stopped bleeding and I am feeling SunSmile GREAT! Cleans gently yet effectively and has minty, refreshing flavor. The ingredients are gentle on your teeth enamel so as not to hurt the protective enamel on your teeth. 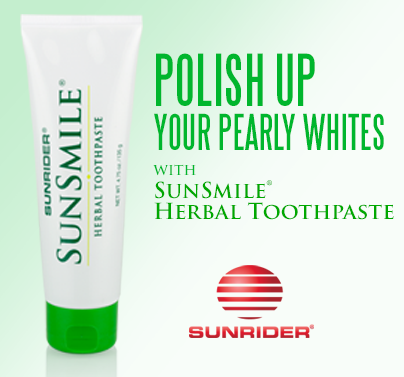 Polish up your pearly whites with the best Mother Nature has to offer, SunSmile Herbal Toothpaste! Get it here today ! I personally promise you that you will just love the Sunrider SunSmile Herbal Toothpaste, if not let ME know and I will personally reimburse you the FULL amount! Our family has been enjoying the great health benefits of using the Sunrider Herbal toothpaste! Be the first to review “SUNSMILE HERBAL TOOTHPASTE” Click here to cancel reply.